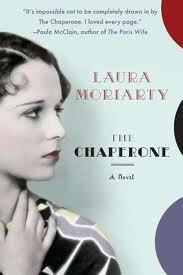 The Chaperone, by Laura Moriarty, is a fabulous book on every level. The surprising story of a middle-aged matriarch leaves no twist in society unexplored, leaves no comment on morality, success or life itself unsaid. And it's all said in brilliant story-telling prose meant to make a reader think about the ideas behind the themes without even realizing it. As you turn the pages wondering what will happen to the chaperone, Cora, and her 15-year-old charge, you are actually thinking about the human constructs of acceptance and loss, wondering about the human definitions of success and failure, and contemplating where morality really lies in the span of our own lives. It starts slowly, but the descriptions carry you through the first few chapters, and these are necessary to set the melodious and normal backdrop that the adventures and ideas take root against. It provides the necessary context of a mid-western life, and the stunning contrast of modernity, momentum and gumption that even the most normal people show over the passage of time. And yet the storyline disputes set the resolutions up so wonderously soundly that not only are you gladdened at the end--for life, for people, for ideas--you're also aware that beneath the surface of these words, these stories, is a lingering message, a message about how we define our own little worlds, about how short-sighted people can see. We see how our mundane-seeming lives and thoughts are all pieces of a bigger, interlocking puzzle. I think the biggest testament to this book, though, is not what I think of it, but how it made me feel. And not about the specific thoughts within the book, but about me. About my family. About life. I felt good; I feel good. It allowed me to open my view of life, even if just momentarily. I saw my life not as a 30-year-old mother of twins, but as I was as a child, and as I will be as an older adult. It reminded me that even though each day seems tediously the same, so many changes are subtly occurring inside and out that every moment is driving to the next, and every action can make a difference. In the book, Cora lives through horse-drawn buggies, Prohibition, two world wars, the Depression, the civil rights era, all the way up to the 1980s. She goes from wearing corsets to watching gay pride rallies. Life can be long and it is always beautiful. And after reading her complicated tale, I look at my own simple life with my loving husband and kids and I am grateful to be me, living in the era in which I live. Yes, things can be bad, in the immediate, but long-term, life is beautiful. This is the best book I've read in a long time. Only a few years before becoming a famous actress and an icon for her generation, a fifteen-year-old Louise Brooks leaves Wichita to make it big in New York. Much to her annoyance, she is accompanied by a thirty-six year old chaperone who is neither mother nor friend. Cora Carlisle is a complicated but traditional woman with her own reasons for making the trip. She has no idea what she's in for: Young Louise, already stunningly beautiful and sporting her famous blunt bangs and black bob, is known for her arrogance and her lack of respect for convention. Ultimately, the five weeks they spend together will change their lives forever. For Cora, New York holds the promise of discovery that might prove an answer to the question at the center of her being, and even as she does her best to watch over Louise in a strange and bustling city, she embarks on her own mission. And while what she finds isn't what she anticipated, it liberates her in a way she could not have imagined. Over the course of the summer, Cora's eyes are opened to the promise of the twentieth century and a new understanding of the possibilities for being fully alive. While I received this book as part of the BlogHer Book Club, all opinions are my own. Go on over there to hear more reviews and discussions about this spellbinding book. I love the development of the character...just when I thought the book was going in one direction...it went off to another and really delved into the 'why' the character was the way she was. Also, it's a reminder that all things back then really weren't very different than the way things are today. I highly recommend this book. This was a winner. So many interesting characters & some shocking behavior for the time. I kept me glued to the end.